Nordic Industries Development LLC brought again a group of leading industry experts from USA’s Midwest to Finland in June. They met Finnish companies, authorities and gave their insights of how to develop, build a solid business case and succeed in the US markets. The Pro-Seminars were held in Tampere on Wednesday 10th of June and in Helsinki on Thursday 11th of June. USA manufacturing and economy is booming and Midwest, especially State of Ohio, is the center of it all. 52% of U.S. manufacturing and 41% of U.S. purchasing power is within 1000 km radius from Ohio. In other words, this is where the manufacturing industry of USA is based and opportunities abound. Many Finnish companies such as, Huhtamäki Oy, Fastems Oy, Halton Oy, Mapvision Oy, as well as foreign companies such as Mazak, Makino, Siemens have chosen Midwest and the state of Ohio as their American base. While our visiting guests speakers are responsible of helping foreign companies to get their business up and running. They are also developing one of the fastest growing manufacturing ecosystems in the USA. They shared valuable insights of how the local and sector specific business ecosystems work, how to develop the markets and what were the key factors for other European companies in their success stories in the heartland of industrial America. 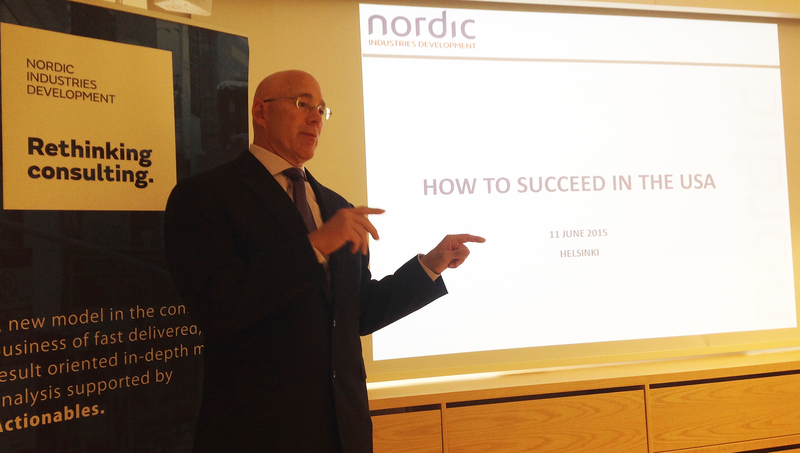 The US ambassador to Finland, Bruce J. Oreck opening the seminar in Helsinki. ANNE CAPPEL is Executive Director of the European-American Chamber of Commerce of Greater Cincinnati (EACC). Under her leadership, since 2007, the EACC has integrated strongly to local business landscape becoming key contact for foreign companies wanting to establish operations in Midwest. Her organization is responsible for more than 300 European companies’ integration to local business ecosystem, making Ohio and especially Cincinnati of the favorite locations for European companies to establish and grow their business in USA. JOE DEHNER chairs the International Services Group of Frost Brown Todd, the biggest law firm in Midwest with offices in 11 states with more than 500 industry specific lawyers. He advises on corporate legal/business issues such as, transnational investment, mergers and acquisitions, joint ventures, business structures, distribution and agency agreements and the resolution of international disputes. An honors graduate of Princeton University (1970) and Harvard Law School (1973), Mr. Dehner has chaired the firm’s international practice for many years, from an office in Cincinnati, Ohio. His client portfolio comprises many companies ranging from automotive to manufacturing. Author of Unlocking America and numerous other publications, he advises American companies, but also various Finnish and other foreign companies about legal issues doing business in and with the USA. NEIL HENSLEY is the director of economic development for the City of Blue Ash, which was ranked the sixth fastest growing business region in the USA. He is responsible for the business attraction, retention and expansion efforts for the City which hosts many of the world leading companies such as, GE and Proctor and Gamble. Prior to joining the City of Blue Ash, Neil was with the Cincinnati USA Regional Chamber for 30 years, responsible for international business development activities. He has worked with hundreds of foreign companies assisting them to integrate into Midwestern markets and helping to attract thousands of new jobs and hundreds of millions of dollars in investment for the region. Neil is a founding board member of the Japan America Society of Greater Cincinnati. In addition, he is active in the European American Chamber of Commerce and the India – U.S. Business Network. SHEILA SPRADLIN REICH is the Managing Director of International Banking for the Huntington Regional Bank. Ms. Spradlin Reich brings over 25 years of International Business experience primarily in leadership roles in International Banking and Foreign Exchange Trading. She is a key advisor in banking for many European and international companies doing business in North America. She has lived many years in Europe and knows well the differences between corporate banking in Europe and USA. Today, she serves as the Treasurer of the Japan Midwest Association and Vice President on the Board of Trustees for the Japan America Society of Greater Cincinnati. The seminars were organized jointly with Nordic Industries Development LLC, U.S Commercial Service, Wulff Entre and local partners Helsinki Region Chamber of Commerce, Enterprise Europe Network and Tampere Chamber of Commerce.